My grandfather passed away on March 18th. I found out when my dad called to tell me that his obituary was in the local paper. For most people with families, finding out about the death of a grandparent this way may seem odd. Well, to be honest, it is, but that’s me, my family & my entire life. I did not have a close relationship with my grandfather. I barely knew him actually. This fact has always left a gaping hole in my heart, because the times I did know him I adored him & his entire family. The reasons for my grandpa not being in my life were solidified before my birth. I had nothing to do with it, but for some reason it never felt that way. I didn’t even know he existed until I was 12 years old & I was forced to go to his house & meet him. My dad never asked me if I wanted this person in my life & a year & a half later, he again didn’t ask if I was ok with having him ripped right back out of my life. It was never explained to me, like most things in life when I was growing up, like my MANY step-mothers, moving from place to place & the list goes on & on. When I met my grandpa (or as his grandchildren call him, poppa) he had been remarried to a very nice lady since 1953. Together they had 7 children, who were all loving, respectful & wonderful people, unlike the useless relatives I was forced to be around growing up. These people did not judge me, they accepted & loved me for the goofy, slightly odd kid that I was. I thought they walked on water for that! How awesome that they just liked me, I was the luckiest girl in the world…….until one day it was all gone & life just went back to the same scary hell it was before they were forced into my life. I harbored a lot of anger towards my dad for this painful event for many years. The worst part was that he flat out refused to discuss the issue, or any others really, with me. This was when I REALLY began to act out & my life took a turn for the worse that I wouldn’t recover from for decades. In 2007, I had decided that I had to contact this man who I had missed so much for so long. While in Florida for work, I looked him up, knowing he lived in that state. I found him within 15 minutes, thanks to the help of my mom, who was always very supportive of me contacting my grandpa, knowing that my dads perspective was incredibly distorted. She found & gave me his phone number. I stared at it for what felt like hours, but I’m sure it was only a few minutes & with my heart pounding & hands sweating I dialed his number. Of course he answered on the second ring, I gulped & said hello, I believe that I am your granddaughter Jennifer. He said that in fact I was & that he was very happy to hear from me. I asked if I could see him, but he informed me that he & his wife were leaving first thing in the morning to start driving to Detroit. I laughed at this, because I was heading back there myself a few days later & told him so. He insisted that I call him as soon as I got home at my Aunt Beth’s house, so we could figure out a day to get together. I think I cried for nearly an hour after we hung up. I felt so relieved & excited at the thought of seeing him again & he seemed genuinely happy to hear from me. When I returned to Detroit a few days later, I again stared at this piece of paper with a growing list of phone numbers on it & got up the nerve to call this house, not knowing who would answer, what to say or how to ask to speak to my grandpa. When I called, my “cousin” Wayne answered & I asked to speak to Mr. Newton…..I didn’t know what else to say. When he got on the phone, he praised me for calling & told me how happy he was that I did…..wow, did my heart smile at the sound of that coming from him. See, for the longest time, I thought this family didn’t want me, what else would a 14 year old who was hated by & shunned from the rest of her family think? He informed me that I would be attending a family gathering at my Aunts house a few days later. I love how he didn’t even consider asking me. I just said absolutely that I would be there & asked what time I should show up. I was SO, SO scared! I can still feel that fear when think back to that day. One of my close friends, Sarah, lived near my aunt & she offered to meet me outside there house & even go in with me if I wanted. I told her that going in with me wasn’t necessary, but could she please come meet me down the street to talk me out of driving away. The anxiety was nearly unbearable. I’m surprised I didn’t collapse in the car or on the street when I stepped out. Sarah gave me a wonderful pep talk & off I went to face my “family”. As I walked up my aunts driveway, I was sure it was a half mile long. Seriously, it felt like it took forever to get to the backyard. When I was in eyeshot, my grandpa’s wife, Elenore, said his name & motioned towards me. As soon as he saw me, he smiled this big, beautiful smile, stood up & began to walk towards me, to meet me at the gate. As he embraced me tightly, he whispered in my ear “you look good, kid. I’m glad you’re here” I must admit, I cried a little at that moment. I also exhaled. He put his arm around me & proceeded to walk me around this HUGE circle of people that consisted of his children, their spouses & some of their children. My aunts, uncles & their spouses were incredibly warm to me. My cousins, well, that’s a very different story. They were upset by my presence & I have since learned they never knew I existed & were not warned that I would be there that day. They made their displeasure known to me. When we were done walking around re-meeting everybody, my grandfather & I took our seat at the far end of the circle, near the house. He insisted that I sit directly next to him & stay there. Like I was gonna say no. We spoke a lot, about many different topics, including my Cherokee heritage that I was never aware of but look forward to researching! We also discussed the problems between he & my grandma, as well as the issues between he & my dad. I made it very clear that I wasn’t aware of anything that went on, but that I didn’t want to really speculate or speak on anyone else’s behalf. I could only speak for myself, the pain that not being a part of his family caused me & that I was so grateful to have reconnected with him. He informed me on this day that he was suffering from Congestive Heart Failure. My own heart sank, because I know what that meant. It meant that he was limited in the years he had left to live. I was devastated. I had only just got him back. Damn, life really isn’t fair sometimes. I stayed at that gathering longer than anyone else. I honestly didn’t want to leave my grandfather. His stories were so interesting & I just felt a strong connection to him & being with him was very comforting to me in a way that I still don’t understand. As I was leaving, having had so many family members invite me to upcoming holiday events, I had every intention of staying in touch with these people, who once again seemed truly happy to have me around. But with the way the grandchildren treated me, the fear & intimidation I felt by this big loving family that I didn’t understand, I’m ashamed to say I did not stay in touch with any of them, including my grandfather. I did speak to him one more time on the telephone, during which I told him I loved him. I’m glad I did, as it was the last time I ever spoke to him. I decided to go to his funeral, to say goodbye & pay my respects to the family. I was so pleased that my dad decided to go with me as well. I knew that it would be so very healing for him & he really needed to reconcile himself to all the pain & emptiness he has carried with him for his entire life. It was awkward, but in the end I am glad that I went. I reconnected with my aunts, not so much my uncles, but that doesn’t really matter to me, as I never really felt I wanted or needed to be close to them. I also was able to meet my grandfathers brother & sister, who are luckily still alive. apparently I look a lot like my Great Aunt Jeanne & I look forward to spending some time with her & getting to know her better while she is still around. She’s really something else & I can see where I am like her. I also can’t wait to go down to Florida to visit her & look through her old pictures & listen to the accompanying stories. I don’t really know what happens now. I am really sad that my grandpa died. He was a good man who told great stories & was an excellent barber. 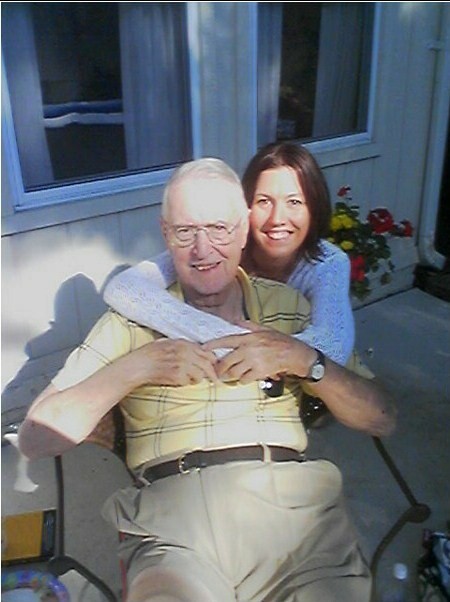 He was a loving & devoted husband, father & grandfather. I only wish I would have been included in his family, I feel my life would have been dramatically different had they all been in my life. I can only go forward though, so that is irrelevant.